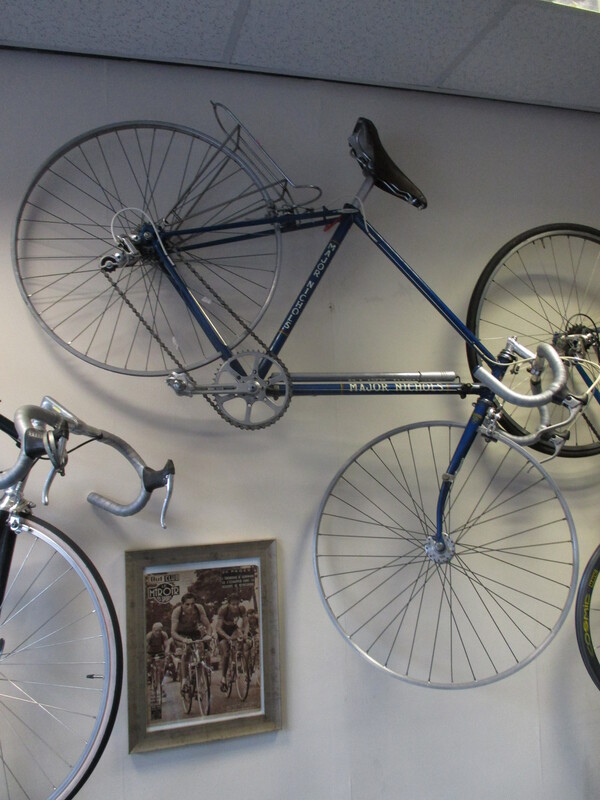 This little machine decorates Sean’s shop wall in Moseley, Birmingham and was spotted by a Major Nichols enthusiast. 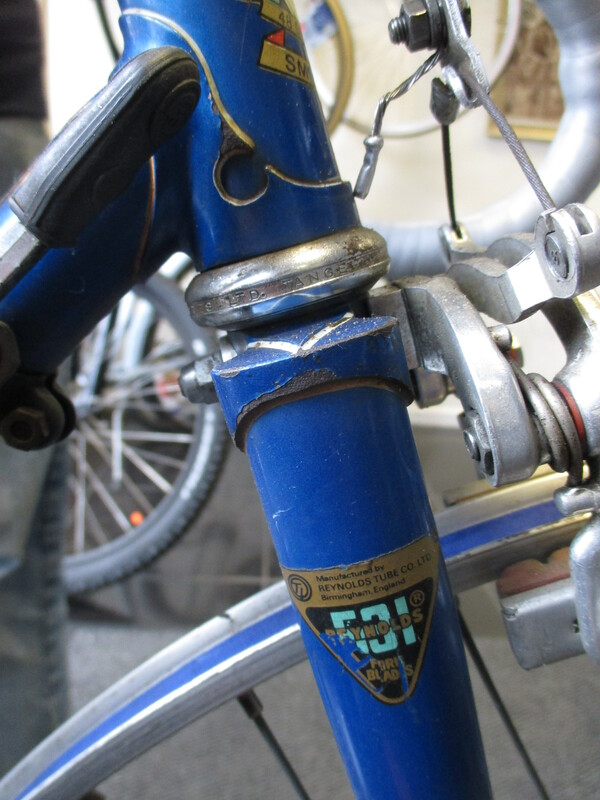 The frame is in good original finish and it’s particular interest is the head tube lugs which appear to be modified long spearpoint Prugnat, drilled and filed to look similar to the well known Prugnat 62D but clearly different. A new one to me. This was acquired from a lady in Moseley. A 21” frame built with generous clearances to take mudguards and give a comfortable ride. Built with modified long spearpoint Prugnat lugs with heartshape cutouts. 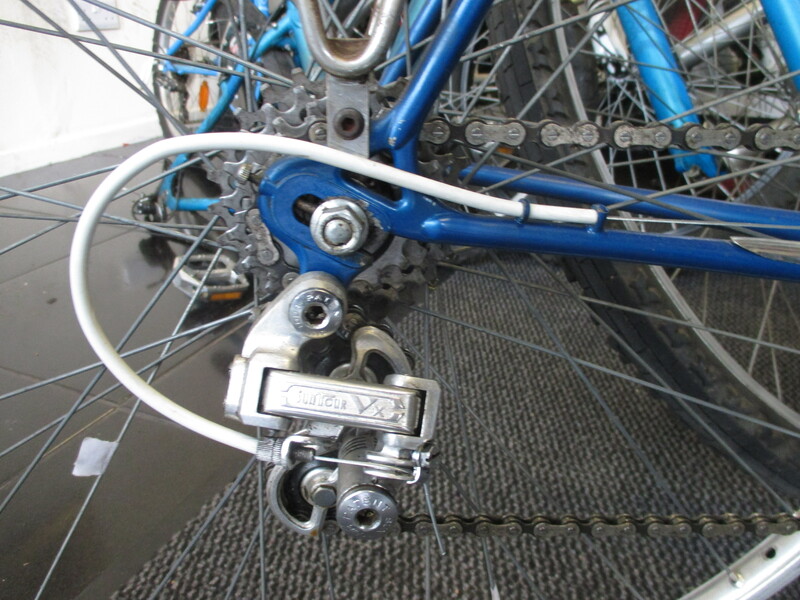 Curved reinforced seat stay bridge, centre pull brake bridge and straight chainstay bridge. 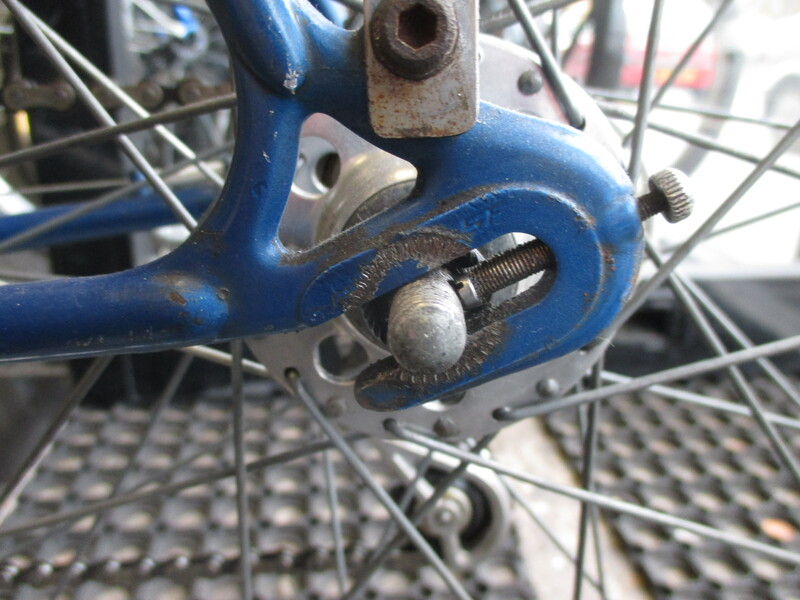 Light boss on offside fork blade. Pump pegs on DT top. 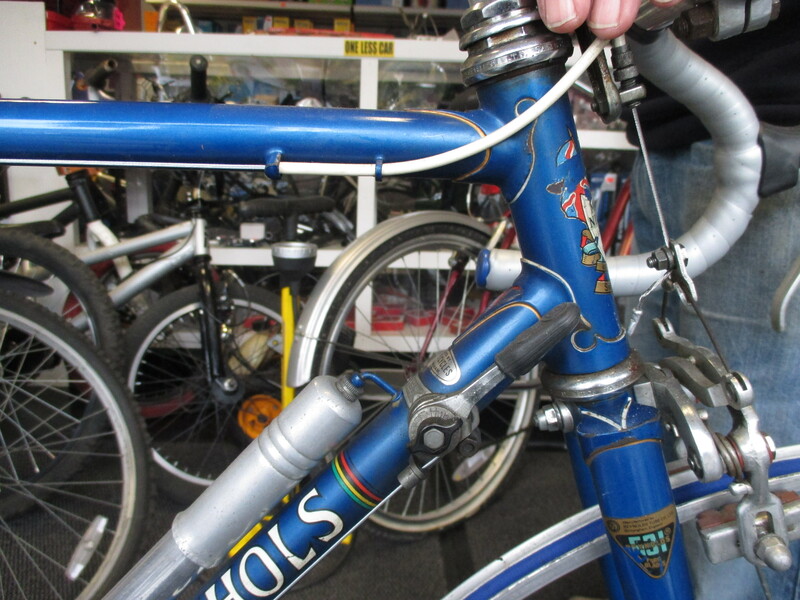 Cable guides for rear derailleur and rear brake at 4 o’clock on TT offside. I like the way the rear one is angled to point the cable in a good arc. 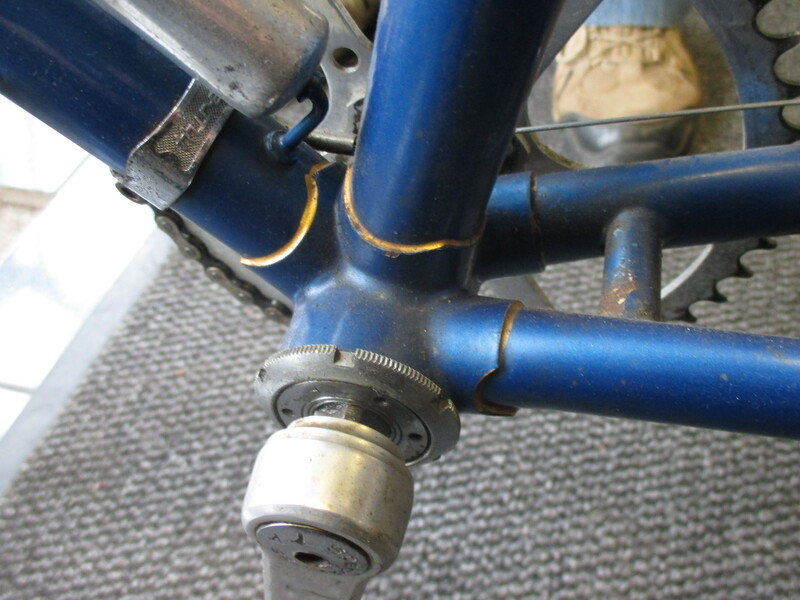 Mudguard and pannier rack eyes on dropouts and seat stays. Surprisingly no bottle bosses. Full wrapover seatstays with double fishtail motif. 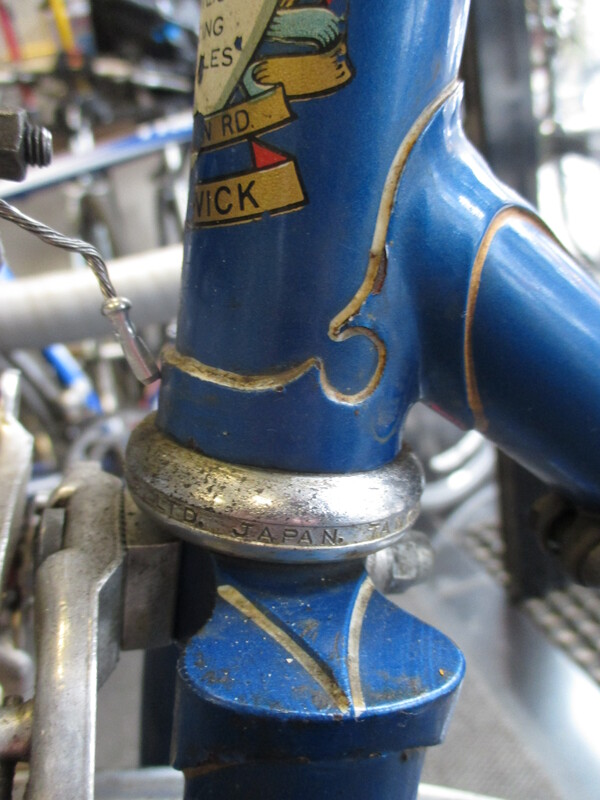 The Fork Crown is one we see especially in later frames, Cinelli style, but not a pattern for which I have details. The flat top has the lozenge fraise (the strawberry shaped triangles) on the top. Lug lining in white and gold with white double fishtail motifs. The finish is original blue metallic and in pretty good shape. 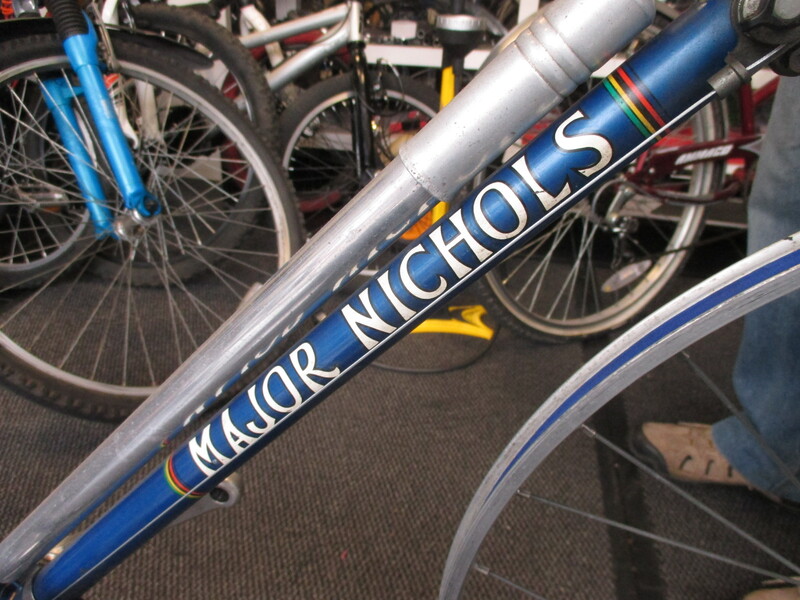 Durban Road Smethwick head transfer and Gothic script down and seat tube Major Nichols transfers with multicolour bands. 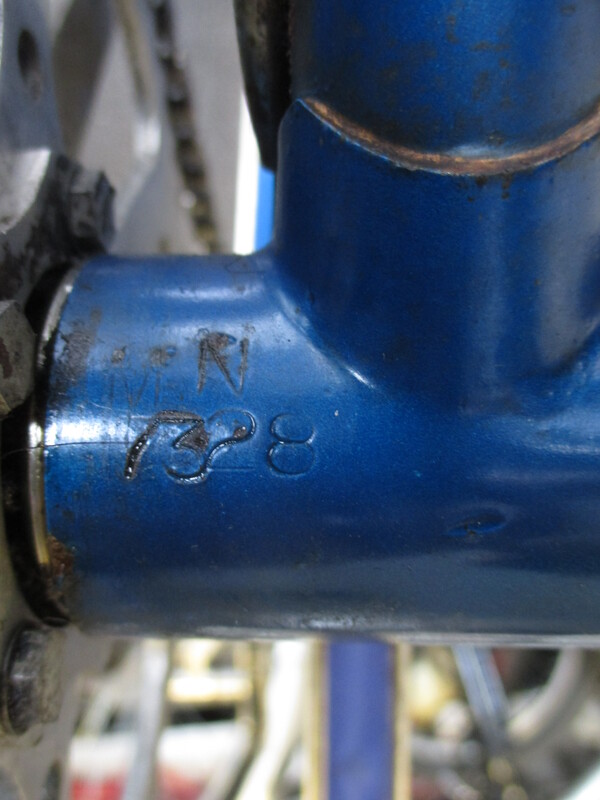 The Reynolds fork and DT decals confirm the build date at 1973. 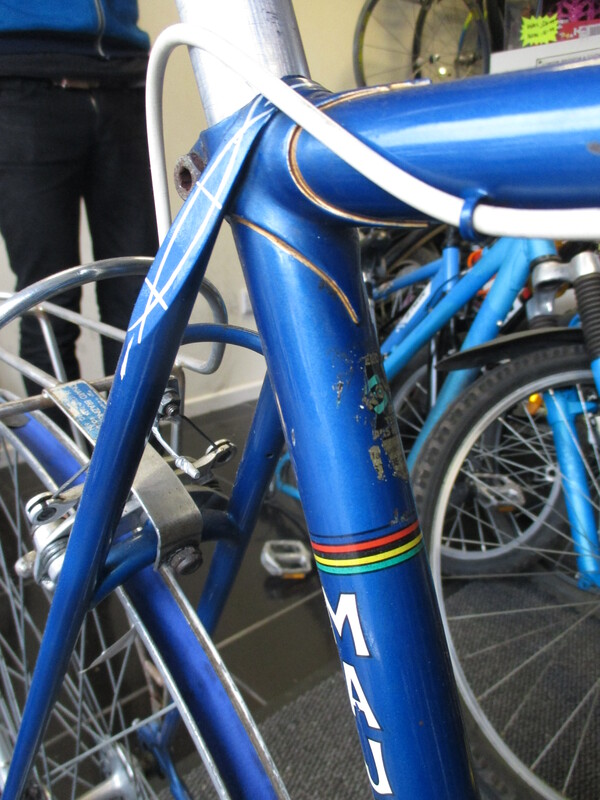 This frame or bike was sold by Priory Cycle, one of Major’s agents. Tange Headset, GB Spearpoint Stem, Weinmann levers on alloy period bars, Weinmann Vainqueur 999 callipers, TA chainset and Suntour VX Rear Derailleur and band-on shifter. 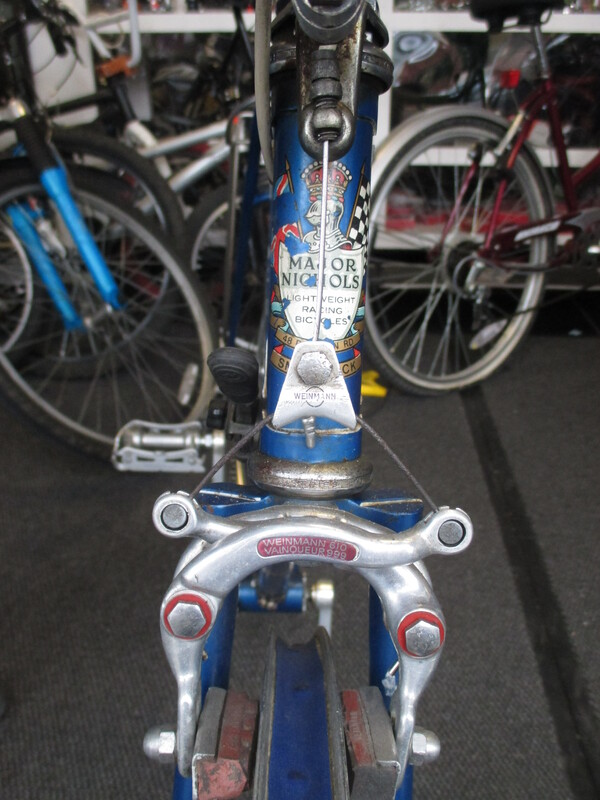 SR Campagnolo look-a-like pedals. Weinmann rims. Nice Tan Brooks saddle. 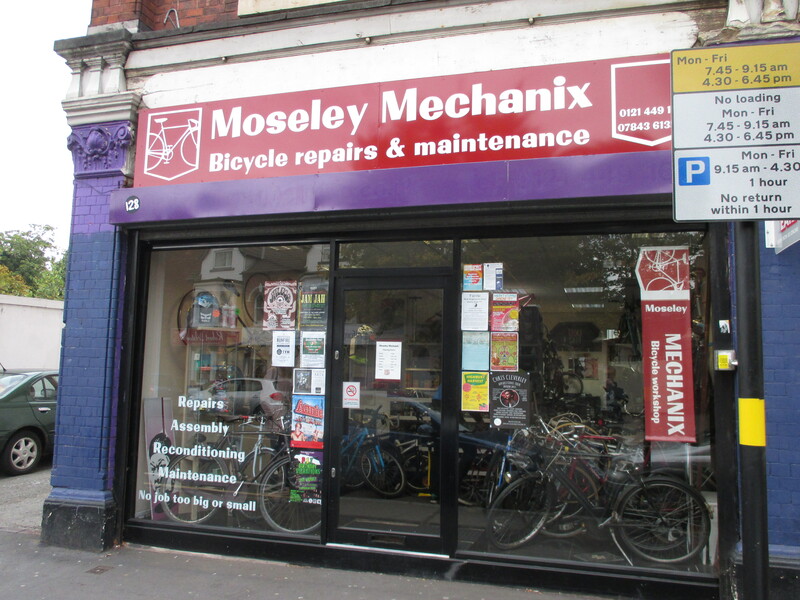 Moseley Mechanix is a shop to serve the local community. 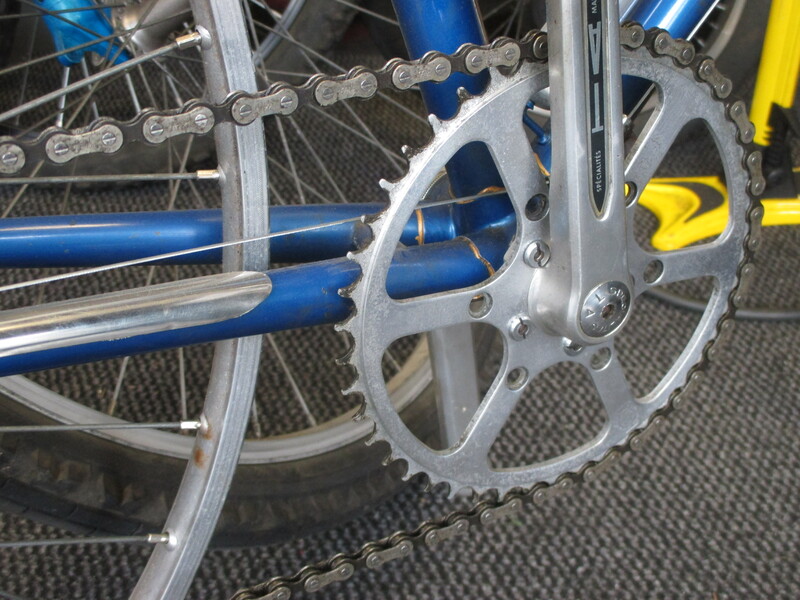 Sean is a fully qualified cycle mechanic with many years experience and offers his services at very competitive rates. 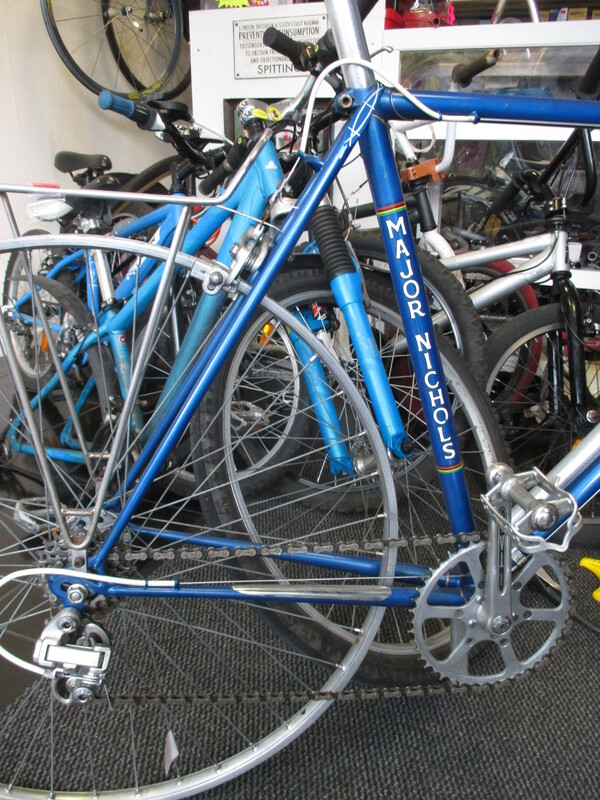 He refurbishes and sells used bikes, new and used parts and has a good store of high quality NOS spokes! 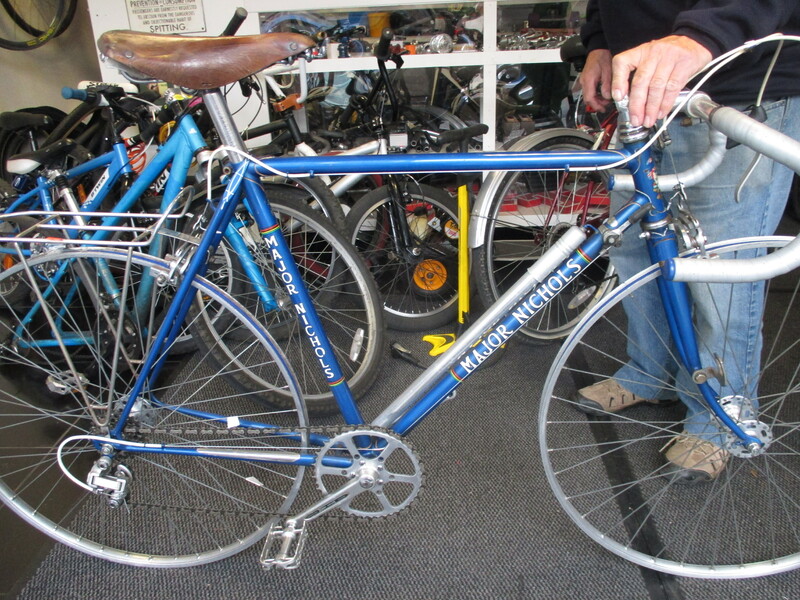 He started work close to Major’s Durban Road shop for a competitor but always wanted one of his bikes. Now he has one and intends to be at our next MN ride and a really nice guy too!